County members are revolting. There, I've said it. I'm not talking about that 'oh so eligible' overweight bachelor, perennially in the same seat, who sprays peanuts and other remnants of his packed lunch at you as he discusses the merits of his county, although he is indeed, fairly revolting. I'm talking about county members who are giving up their memberships. And in droves. The scheduling of the ECB has got under the skin of many cricket fans up and down the country and people are starting to vote with their wallet. The game in the UK is on a knife edge. The oldest festival in cricket at Cheltenham...but for how long? The scheduling of county cricket in this country has become a joke. So much so, that many members have had enough. The treatment of supporters as a commodity has pissed fans off from Hampshire to Durham as well as the other sixteen counties. Middle Stump follower, David Meers pointed out to me, "Our summer of Bank Holiday cricket in the UK has been as follows; Mon 7th May - Day 4 of 5 x County Games. Mon 28th May - Day 4 of 2 x Div 2 County Games. Mon 27th August - Zero cricket of any County Game. In addition there have been no England games either". Eyebrows were raised at the start of the season with regards to the amount of County Championship games that have been crammed into April, early May and September apart from the odd one here or there, or heaven forbid, a pink ball game. The golden goose, our T20 competition has been put into a block in July and August, thus making the Championship a second class citizen. People can't take time off work that easily in the week but the weekend seems to be vacant, as far as being able to watch our summer game is concerned. This is killing the interest of cricket fans. So when you have no game on a Bank Holiday scheduled, is this the way to encourage memberships to be taken out? If your local cinema only showed matinee performances you can bet your bottom dollar that it wouldn't last very long. It isn't just with County Cricket that the fans are getting shafted either. The four counties who have loyal followings, sitting through their T20 Blast campaigns have been given a grand total of 500 tickets each. What should be a fantastic occasion has left a sour taste for many fans who won't be able to watch their heroes who have got them to such a prestigious event. Except on television. And one that you have to subscribe to. England's batting woes at present could well be down to the poor scheduling of the organisers in the ECB. Certainly if you are a county spinner and you come out for a few days in September, akin to a Daddy Longlegs, then it isn't going to induce you to bowl as you would in Test conditions. Bowling with flight, guile and men around the bat will become a dying art, instead we are seeing a plethora of flat, one day spinners not even trying to give it a rip. 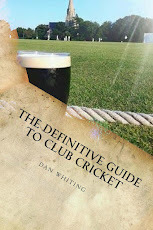 County cricket is the breeding ground, the talent pool that Test cricket fishes in. If the pond runs out of water, the bars at Test cricket don't run out of beer. Many fans who are members or season ticket holders are furious. The Shires are revolting against the ECB and due to seeing a handful of games this summer, many have found their annual passes offering poor value for money - exactly the opposite of what they should be. In addition, the outground is dying out. A great way for counties to take their wares to far flung areas of their region, is about to become the dodo of the game as club grounds struggle to cope in April or September. A quick snap poll on Twitter found that a quarter of supporters were considering giving up their membership. Another quarter were toying with the idea of one more year. Another quarter were happy to continue but unhappy with the scheduling. The ECB have to do something about this and quickly. County chairmen have to make their point at the AGM. I know that the amount of people who attend games isn't hugely important these days in most sports, thanks to television rights, sponsorship deals and a host of off field revenue streams but the target audience is slowly dwindling and that is a huge issue for all of us who love the game. Fans have to come before money. To misquote Bill Shankly, "Cricket without the fans, is nothing." With this need to put the white ball comps in to blocks at a behest of the players/groundstaff. Why not put the County Championship games in to blocks too. By playing the 50 over ODC, Group matches in April/Early May. You could then have a block of 7/8 CC matches. At the height of the summer complete the ODC (semi's +Final) Then start 20 over games (in the same slot as now) And then like now you can have 6/7 matches to complete the season. I believe next year they will want to complete the ODC before the World Cup, and not start the 20 over till after the final. So it should in theory be a lot better than this year. I agree with the comments made,and to that end just a shuffle round of ideas is my want. T20 matches can be played after school/work and at present are an uneven match twixt bat and ball on good middle summer pitches. Perhaps as a precursor to the main event the competition could be played in April/May/June. Championship and test cricket ought to be played when the light is best, the pitches dry and true and school kids and families are able to come all day,with entertainment of sorts between sessions organised.50over cricket can be slotted in anytime that suits the club's involved.Why not reintroduce capable minor counties and make the 50 over format one of a straight knock out like the FA Cup in football or if this is too short have 6 regional groups with top teams and 2 best runners up.These ought to be played either end of the season,and set aside the months of June,July and August for test and county.More "extreme" conditions at the beginning and end of season would bring a better balance between bat and ball. It's something also to look at if our summers are to improve and staycation becomes more popular,that Hove is the only place along the South coast that hosts a first class venue. And the other two sides up to Scotland do not fair any better. Something to chew over. I have given up mine this year. Yearly member at Worcestershire since I moved here in 2010. The season is a pale shadow of what it was for the 4 day fan. Hardly a game to speak of from June - August when I would finish early to take in the afternoon/evenimg session. Absolutely no value for money for the few days of cricket in decent weather I could see this year and paying on the gate. It's almost as if there is a deliberate act of vandalism to get rid of the county game. Love the spinner as Daddy Longlegs analogy. Thanks for the comments Gents. All valid points.